Go, Lovely Rose / The Evil Wish. As the editor of Booklist told us in his cover letter: "A star beside the title indicates a work judged to be outstanding in its genre." 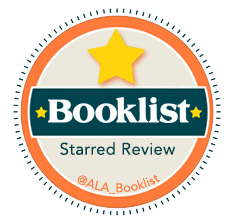 More importantly, Booklist is the reviewing and news journal of the American Library Association, the magazine which thousands of librarians across the US use to make their decisions in purchasing new books for their collections. Let's hope that the review can drum up sales for libraries all over the USA. That would make me immensely happy! From the Department of Life's Unexpected Ironies: The author of this review is writer and English professor Don Crinklaw who not only is the husband of mystery writer Elaine Viets, he also used to be a somewhat regular customer of mine over ten years ago when I was selling books as the owner of Pretty Sinister Books, my former online bookstore. Potts is indeed worth reviving. Such a good writer, you are doing great work reviving her! Excellent news. Local libraries do pay attention to such things.